Add some wasabi to your favorite salad dressing: instant excitement and no additional calories. Photo courtesy of the National Pork Board. Like any good seasoning, wasabi’s horizons are broad. Here are just a few ideas: you’ll enjoy experimenting with it whether you use a genuine wasabi powder like Real Wasabi™ or advance to the sublime experience of grated fresh wasabi root. Brush rhizome with a stiff brush under running water to clean and remove any untrimmed roots. Cut about 1/4 inch below leaf stems. Grind from cut end. You can use a fine stainless steel grater, although experts believe the best flavor, texture and consistency result from using a traditional sharkskin grater called an oroshi, or secondarily, a fine-tooth ceramic grater. Use a circular motion, keeping the rhizome at a 90-degree angle to the grater. This is important: it minimizes dissipation of volatile chemicals which (like onion and horseradish fumes) cause tearing. Grate only what will be consumed within 15 to 20 minutes. After then, before the flavor dissipates. Place the wasabi paste in small bowl. Stir in vodka until blended. Mix the tomato juice, Worcestershire Sauce, hot sauce, and pepper. Combine with vodka and wasabi mixture. Pour celery salt in a saucer (or, use a Bloody Mary drink rimmer). Rub a highball glass rim with the lime wedge. Dip the wet rim in the celery salt. Fill a glass with ice. Pour in the cocktail mixture. Squeeze the lime wedge into the glass. Stir and garnish with the celery stalk. Adding wasabi to vodka creates a foamy green cocktail. In contrast to most drinks which get more watery over time, here the initial taste is mild, but after several minutes the heat and flavor intensify. Some wasabi powder will settle out into the bottom of the glass: it can be stirred back into the liquid with the stem of the leaf (or a swizzle stick), or eaten. Combine vodka and wasabi powder in a shaker. Swirl to ensure that all wasabi powder is wet. Add crushed ice and shake vigorously. Strain into a chilled martini glass. Garnish with wasabi leaf or celery leaves. Note: We have seen a sweet versions called “Wasabi Martini” at bars and restaurants. Examples include Stoli vanilla, sake, and wasabi; and vodka, fresh lime juice, simple syrup and wasabi. These recipes use wasabi for a kick—and there’s nothing wrong with that—but true wasabi lovers will appreciate the simple pairing of wasabi and vodka, above. California rolls aren’t the only Cal-Japanese fusion food: wasabi vinaigrette and avocados are another great match. Add wasabi paste to your favorite vinaigrette. Start with one teaspoon to a cup of vinaigrette (we use a basic vinaigrette of 2 parts acid, including vinegar and/or citrus juice and 3 parts oil). Add more depending on your personal taste. Asian Vinaigrette: whisk together 3 teaspoons wasabi paste, 6 teaspoons soy sauce, 1/3 cup rice vinegar, 3/4 cup vegetable (we prefer olive oil). Sweet Asian Vinaigrette: 1/2 cup rice wine vinegar, 1/2 cup olive oil, 4 teaspoons honey, 2 teaspoons lime juice, 1⁄2 tsp. salt, and 1 or more teaspoons wasabi paste to taste. A dressing variation for avocados: use the classic sushi/sashimi condiment as a dressing for avocados. Combine 1/4-1/2 teaspoon of wasabi paste with 1 teaspoon soy sauce. Fill the well of an avocado half. 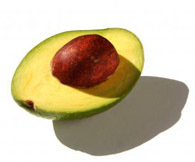 Fill the well of a ripe avocado half; or slice the avocado and plate it with greens. 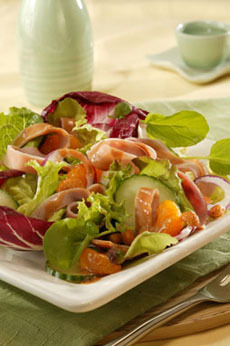 Or, toss a green salad, a seafood salad, or any luncheon salad (turkey, ham, orange segments, mango). Another great idea: pasta salad! 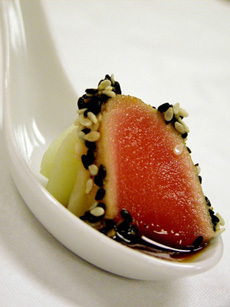 You can add shrimp, scallops, calamari, grilled tuna, and garnish with toasted sesame seeds. vinaigrette, or sliced with greens. 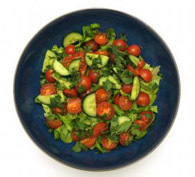 green salad. Photo by Paul Preacher. Combine the fish, onion, tomatoes, wasabi paste, salt, and hot sauce in a glass or ceramic dish (don’t use metal). Cover with lime and lemon juice, coating fish thoroughly. Leave covered in the refrigerator for an hour, then stir again to ensure thorough coating of fish with the citrus juice. Let the mixture sit for at least 6 hours, giving time for the flavors to blend. Garnish with an avocado slice and chopped cilantro. One of our favorite comfort foods, updated. We love it with steak, chicken, fish (especially grilled salmon and tuna), or just about anything (including Asian food). If you’re a vegetarian—or having guests who are—it can be the highlight of a meal. The wasabi gives the potatoes a slight green color, so consider it along with those green bagels for St. Patrick’s Day. Wasabi mashed potatoes with grilled ahi tuna. Bring the potatoes to boil in a large covered pot of cold salted water. Lower the heat and boil until tender when pierced with a fork (about 12 minutes—23 minutes overall). While the potatoes are cooking, mix the wasabi powder with 1/4 cup of hot water until smooth. Cover the bowl and let it stand for 5 minutes. While the wasabi is standing, in a small saucepan, melt the butter in the milk (use moderately low heat). After the wasabi paste has stood for 5 minutes, stir it into the butter and milk mixture. Peel and mash the potatoes (a ricer is the most efficient way, or use an electric mixer taking care not to over-blend) and stir in the wasabi cream, salt and pepper. NOTE: You can leave the peel on for a rustic presentation. * Russets are the potato of choice here. Yukon Golds have a lovely, thick and creamy texture and can certainly be used, but they have a less strong potato flavor and a more buttery flavor—beautiful, but gets lost under the wasabi. All-purpose Round White potatoes generally don’t have the depth of potato flavor to hold up to the wasabi. Round Red (Red Bliss) will are too dense, without enough base flavor. This serves 6 as a side dish—in theory. But it is so good, everyone will want more; and in fact, we find that it often becomes the focus of the meal. Here’s a versatile and tasty sauce. If you want the “diet” version, use nonfat yogurt instead of whipped cream. Whip the cream, mix in the wasabi. Add the lime juice and salt.